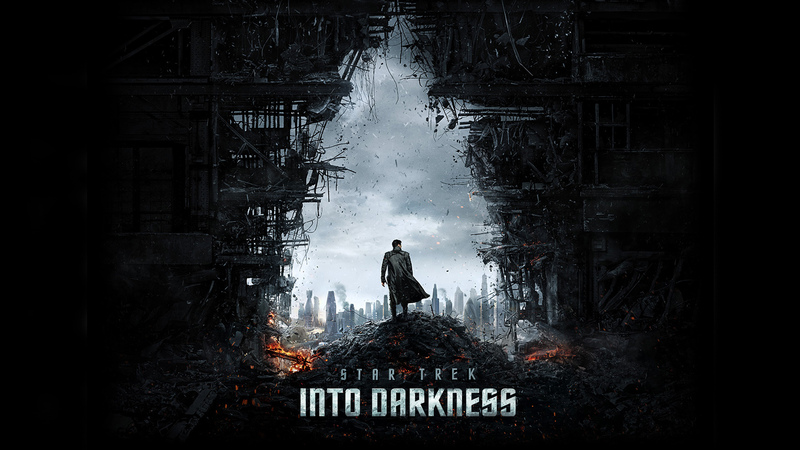 Synopsis: In this much anticipated sequel to J.J. Abrams Star Trek 2009 reboot , the crew of the Enterprise is called back home, they find an unstoppable force of terror from within their own organization has detonated the fleet and everything it stands for, leaving our world in a state of crisis. 1) The idea the universe is multicultural and must be celebrated, the first interracial kiss in broadcast history, a multi ethnic and species crew of the Enterprise, Klingons, Vulcans, Humans, Romulans etc, etc. 2) The Prime Directive of non-interference in a species natural development. 3) Most important the triad-relationship between Captain, James T. Kirk, Science Officer, Mr. Spock and Doctor, Bones McCoy. Against all odds and adversaries the three remain close friends. Regarding the last, this triad can be seen in mostly all the Trek Spin-offs, Voyager for example it’s the friendship between Captain, Janeway and head of security, a Vulcan named Tuvok.. In the film versions of the original series we find Kirk, Spock, McCoy have become a close knit family. J.J. Abrams changed the Trek Universe in 2009 with his Star-Trek reboot. Although he ultimately kept the Trek core values he eradicated several core Federation planets thus starting from scratch. In the end, that film as the new one was a satisfying reboot for old trekkies as well as a nod the younger audiences Trek must embrace to stay alive. It is accepting change and going with it that has kept Star-Trek one of the most enduring sci-fi franchises this side of Dr. Who. Into Darkness picks-up where the last one left off and brings us on a thrill ride of in-jokes, surprise appearances from the past, humor and most of all the development of friendship between Kirk and Spock. Without giving anything away, the film brings us full circle as Kirk battles an enemy within Starfleet and an old adversary that Kirk in this timeline, meets for the first time. 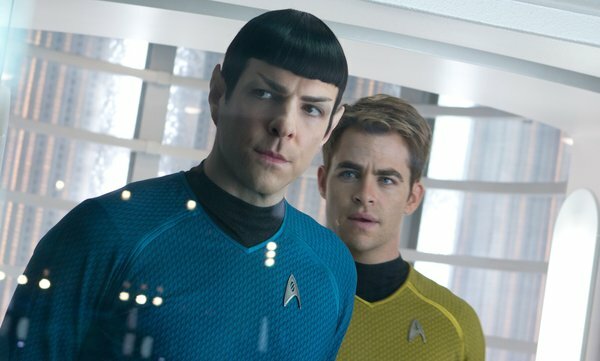 Once again Pike’s Kirk, Quinto’s Spock, and Urban’s McCoy, are spot on. Simon Pegg’s Scotty is frenetic, hilarious and polar opposites of James Doohan’s Scotty, which was wise, ironic and a miracle worker. When Nichelle Nichols first played Uhura, it was groundbreaking television, she was the first black woman to break the color barrier, Zoe Saldana’s Uhura, is not groundbreaking, so as a twist she has been in a romantic relationship with Spock since Abram’s 2009 Trek Reboot. Unfortunately she is not given much to do here until late in the film when she gets involved in the action. Anton Yelchin’s, Checkov, is wide eyed and enthusiastic with extreme Russian accent intact, and John Cho’s, Sulu is also spot on. Benedict Cumberbatch plays John Harrison, a terrorist that wants to destroy the federation. He is a great villain and his story holds true to Trek-lore and history. Nuff said. Star Trek was always a mirror of our times, the use of metaphors and other species to depict the human condition, has always been a necessary component of the Trek Universe. J.J. Abrams has a good handle on this and the film is a nod to the past and a look to the future of the franchise. In today’s world the film debates the issues of genetic engineering, terrorism and weapons of mass destruction. The film works on many levels and I hope it speaks to a younger audience the way the original series has spoken to me all these years. I look forward to Kirk and crew’s 5 year mission that lies ahead as we come full circle in this the second of Abram’s, Trek incarnations.